Apologies, library staff are currently unable to access the the Library’s email inbox (wellcomeunit.library@bodleian.ox.ac.uk). If you have any urgent queries please contact us via the Bodleian History Faculty Library on 01865 277262. This week the Library will be staffed Wednesday 2.15-4.30pm and Thursday 25 July 2.15-5.00pm. If you would like to make an appointment to visit the Library please contact us via the Bodleian History Faculty Library on 01865 277262. IT staff are currently working to resolve this problem and we hope it will be functioning again quickly. NOTE: This problem was resolved on Tuesday 23 July. Email is fully functional again. This entry was posted in News, Services on 23 July 2013 by . 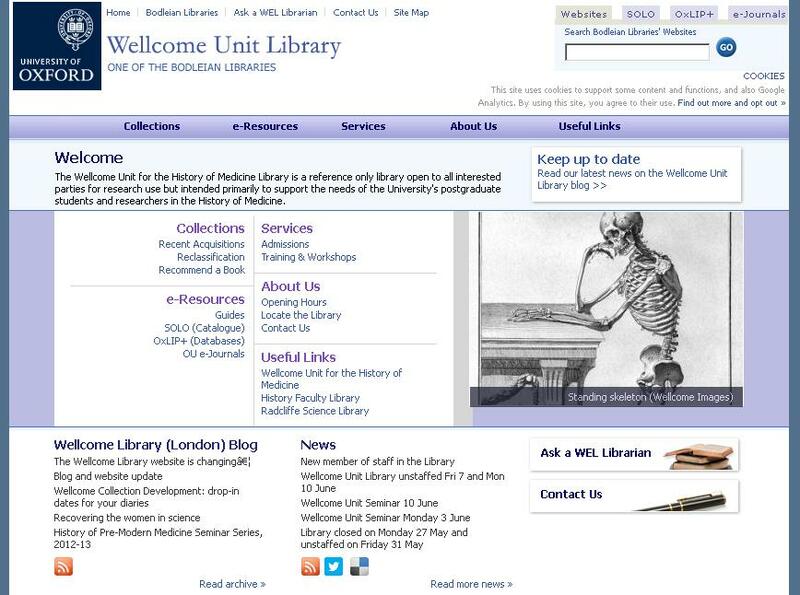 This summer the Wellcome Unit Library will have limited staffed hours. This week the library will be staffed on Tuesday afternoon 2.15-5pm only. Staffed hours in the rest of July and August will be shorter than normal and times will vary. Please do contact the library if you would like to arrange a visit. Even though the library will have briefer opening hours, you can still contact us by email via wellcomeunit.library@bodleian.ox.ac.uk or call us on 01865 274604 during our staff hours. When the library is unstaffed you can contact us by phone via the Bodleian History Faculty Library on 01865 277262. This summer we are also working to improve our website and a new-look website should launch in the coming weeks. While we work to improve the website there may be some disruption to the layout of pages. Please do contact us if you have questions about visiting the Library or what is held in our collections. This entry was posted in News, Opening hours, Services and tagged Opening hours, website on 15 July 2013 by . This week we welcome Laura as a temporary library assistant in the Wellcome Unit Library. She will be working some of the staffed afternoons in the Library. Laura is the Bodleian History Faculty Library Graduate Trainee for 2012-13 and so is well trained in and knowledgeable about the Bodleian Libraries system and services and libraries in Oxford. As well as her library skills, Laura also has also recently gained a PhD in History from King’s College London. This entry was posted in News, Services and tagged Opening hours, staff on 1 July 2013 by .